Hey there. I love fantasy sports. If you've been following the blog lately, you'll see that I started to offer some tips to help build a fantasy football lineup while showcasing my lineup. So far, it's been a mild success. I have a few readers reach out to me for tips and ask how easy it is to get started. Especially when they want to play fantasy sports for cash prizes. So, I'll make it easy for you, friends. I'm going to hook you guys up with $25 to try out fantasy sports. No gimmicks, no long term commitment, no deposit needed, no nothing. 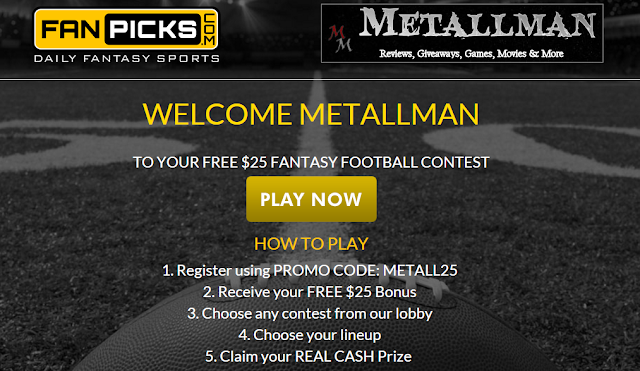 Just sign up at FanPicks and use the Metallman.com exclusive promo code METALL25 and you'll instantly have $25 in your account to start playing fantasy sports for cash! I find fantasy sports exciting. I also found that it has increased my fandom. I find myself watching more games than usual and am actually more informed about the players and teams. I've already signed up and hope you guys will join me. Hope to see you guys there! Later!